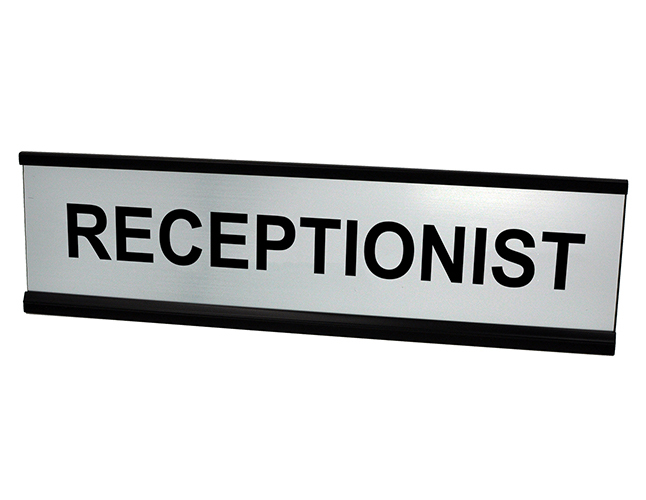 If your welcoming committee changes frequently, take advantage of this quality receptionist plate that be displayed on a desk or wall mounted. Clearly mark your receptionist desk with this quality aluminum plate. This plate can either be free standing or wall mounted and you can select from 4 frame colors. The plastic plate is engraved with "RECEPTIONIST" in all capital letters and you have many choices in color combinations to match your office interior. The plate easily slides into the holder, and if needed, you can replace the plastic plate with other plates that show a different message.